WrestleMania 32 is just under a year away and WWE legend Hulk Hogan is already campaigning for a match. Hulk is ready to lace up the boots for one more Mania match and according to him, he has the support of the CEO. Hulk Hogan has been petitioning for another WrestleMania match ever since he returned to the company last year. Hogan worked hard to rehabilitate his back and pass physicals but in the end he was left off of the 31 card. That isn’t stopping Hogan. Hogan is working even harder to get back in the ring and told reporters at a recent press conference that he is down for whatever opportunities await him in Dallas Texas. There are a few takeaways from this. First and foremost, you can never believe everything you hear from Hogan. Hogan is his best promoter and he’ll tell you just about anything to make some news. 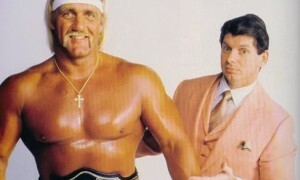 That said, if Hogan does have the support of Vince McMahon, there is a pretty good chance he’ll be back in the ring. Now do I think he is challenging for the WWE title? No, but there are plenty of other things he can do on the card to fill a spot and achieve his goal. 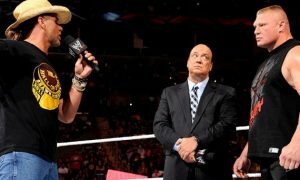 Why would Vince McMahon allow Hogan to get back into the ring? Well, he has a very large stadium to fill. 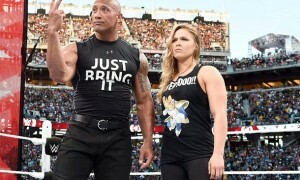 UFC president Dana White has made it clear that Ronda Rousey will not be on the card. That could certainly change but she is nothing that the WWE can count on today. One idea that could resonate with casual fans is to bring Hogan back with a similar storyline that Ric Flair had when he retired at WrestleMania 24. Now I couldn’t imagine Hogan wrestling as many matches as Flair did, but the same idea could work here. I think the idea of a Hulk Hogan Retirement Match on Mania could be big business if presented correctly. Hogan’s physical limitations are always the big question mark. Hogan claims that his back is in better shape than it has been in years and he has been working hard to get in ring shape. 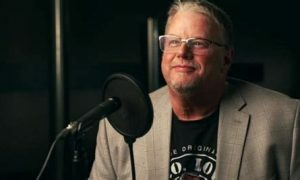 I don’t recall seeing any public medical records to verify Hogan’s claims, however Hogan has looked much better walking around on WWE television than he ever did in TNA. His improvements are obvious, even to doubters, but walking and wrestling are two different things. Hulk will need to pass a physical before he steps through the ropes and that may be his biggest obstacle. Looking ahead to 2015 if you put a Hogan retirement story on a card with Sting vs. Undertaker, a Rock match, Brock Lesnar, and another special attraction you could have something really special for Mania. Ronda Rousey would be the icing on the cake. I could certainly see why Vince would be intrigued and for one more night, I can’t imagine anyone having a big problem with it.